Nagorno-Karabakh conflict: Why now, and why is it a risk for Russia? 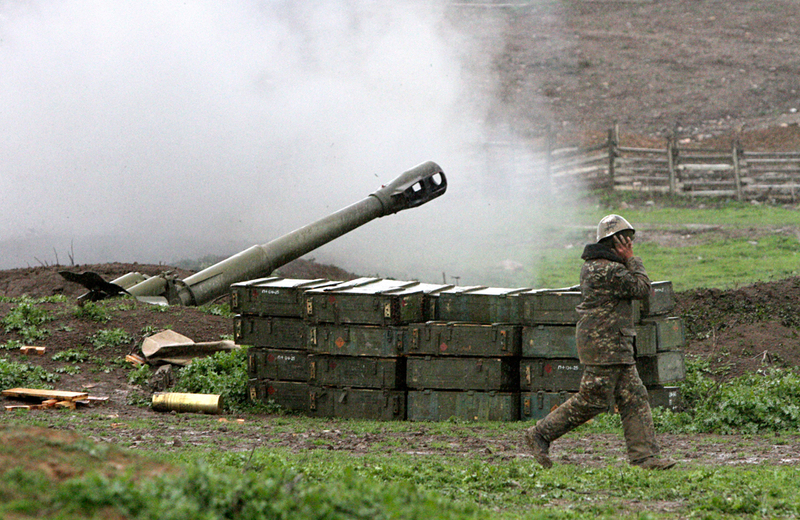 A howitzer fires at an artillery position of the self-defense army of Nagorno-Karabakh near Martakert, April 3, 2016. The first weekend in April marked the heaviest fighting between Azerbaijan and Armenia since 1994, in clashes that have already claimed dozens of lives. RBTH explores what lies behind this recent flare-up in tensions in the South Caucasus and what role Russia is playing, as well as why the conflict is a danger for Moscow. What is the Karabakh conflict about? The conflict in Nagorno-Karabakh is an ethnic conflict between Azerbaijan and Armenia, which was at its height in the final years of the former Soviet Union and broke into a war in 1991-1994. The sides were fighting for control over a territory that was part of Soviet Azerbaijan but was predominantly populated by Armenians. Following Armenia’s victory in the war, which claimed over 15,000 lives, an unrecognized Nagorno-Karabakh republic emerged, supported by Yerevan. Who is behind the recent rise in tensions? Russian observers are convinced that the escalation of the conflict was provoked by Azerbaijan. Given the economic downturn, the authorities in Baku are seeking to divert attention from domestic problems. Furthermore, the Azerbaijani president’s approval rating largely depends on the adoption of a tough stance regarding the return of the occupied territories, whereas Armenia, analysts point out, does not have any domestic political reasons that would prompt it to stir up tensions. Another party interested in seeing the Karabakh conflict return to an active phase may be Ankara. According to Alexander Skakov from the Russian Academy of Sciences’ Institute of Oriental Studies, Turkey may have acted as an agent provocateur in order to once again highlight its significance in the region. At the same time, Russian Foreign Minister Sergei Lavrov has said that Russia is not blaming Ankara for stirring up tension in Nagorno-Karabakh. The current rise in tensions is driving Moscow into a tight corner since it is in Russia’s interests to preserve good relations with both Azerbaijan and Armenia. Furthermore, Russia and Armenia are allies, so a further escalation of the conflict may force Moscow to openly support Yerevan. This would then put into question the “special relations” that Moscow is building with Baku, Alexander Skakov points out. These special relations are manifest, among other things, in the two countries’ active contacts in arms trading. According to media reports, Russia has supplied Azerbaijan with $4 billion worth of weapons. While Skakov says that Russian arms supplies to Baku were a mistake that has played into the hands of those who are interested in the current escalation, Vladimir Yevseyev from the CIS Institute was keen to point out to RBTH that Russia is far from the only supplier of arms to Azerbaijan. So far, Russia has been applying diplomatic levers to put pressure on the sides in the conflict. President Vladimir Putin has appealed to the presidents of both countries to end the hostilities and get down to the negotiating table, while Russian Defense Minister Sergei Shoigu has conducted talks with his Azerbaijani and Armenian counterparts in a bid to de-escalate the situation. What is the danger for Russia? If there is a further escalation, the Azerbaijani-Armenian conflict could spill beyond the boundaries of Nagorno-Karabakh and develop into a full-scale war between Armenia and Azerbaijan. Russia, having entered into a strategic alliance with Armenia, may be forced to use its troops deployed on Armenian territory and thus end up dragged into an armed conflict. In addition, an escalation in Nagorno-Karabakh is fraught with the destabilization of the South Caucasus and Russia’s North Caucasus republics. Experts believe that a full-scale war is unlikely and the current escalation is an attempt by Baku to explore the reaction of all the interested parties. Yet analysts stress that the intermediaries in the Karabakh conflict, including Moscow, should insist on deploying international observers in the region and establishing a mechanism of observation over the conflict. Otherwise, a new escalation is inevitable.